LEGENDARY Scottish piper Fred Morrison will headline a four day festival of bagpiping in the old Third Presbyterian Church in Great James’ Street this weekend. 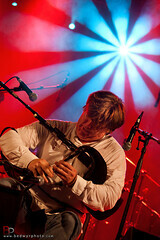 The former Capercaillie star is the main event of Féile Píobairí Uilleann 2013 - the third international piping festival organised by the local uilleann piping fraternity. But whilst the Scottish maestro - proficient on Great Highland bagpipes, Scottish smallpipes, Border pipes, low whistles and the Irish uilleann pipes - is an undoubted highlight the four day event will also feature reed making classes, video workshops and a mini pipe band competition. The festivities kick off on Thursday (November 21) in Cultúrlann Ui Chanáin on Great James’ Street with reed making classes from 3pm. This will be followed by video workshops featuring past pipers at 7pm and recitals by local pipers from 8pm. Friday (November 22) will continue in the same vein but will conclude with recitals from renowned national pipers Paddy O’Hare, Ciaran McPhilemy, Jason Rouse, Tom Clark and Cormac O’Brian. An important new book publication from the Irish Traditional Music Archive will be launched at 6.30 pm on 20 November 2013 in the Trinity Long Room Hub, Trinity College Dublin, at a recital-lecture on Canon James Goodman and his music manuscripts by uilleann piper Peter Browne and ITMA director Nicholas Carolan. Lisa Shields, editor of the volume, will speak. The publication completes a two-volume edition of the manuscript collection of Irish music written by Canon James Goodman in the 1860s and preserved in the Library of Trinity College. The recital-lecture will be the opening event of a lecture series related to the current TCD music exhibition In Tune: A Millennium of Music in Trinity College Library. The volume will first be available for purchase on the night of the launch – cost: €25 (paperback), €35 (hardback) – and thereafter exclusively from the Irish Traditional Music Archive, 73 Merrion Square, Dublin 2, tel. +353-(0)1-661 9699; fax +353-(0)1-662 4585; email queries sales@itma.ie; website purchase http://www.itma.ie Post .and packing extra (see website http://www.itma.ie). Payment by PayPal from website, by cash or cheque.